From the internationally bestselling author of Gossip Girlcomes a dark, psychologically complex update of Black Beautyreplete with jealousy, romance, mystery, and redemption. Merritt Wenner has been self-destructing ever since the tragic deaths of her grandmother and her horse, and after an epic all-night bender she walks out of the SAT and disappears. Her parents, looking for a quick fix, ship her off to a residential equine therapy program. At Good Fences, Merritt meets Red—a failed racehorse and a terror in the barn. Red has never bonded with anyone, but Merritt is not afraid of him, which makes all the difference. Soon they’re sneaking rides after curfew, which catches the attention of Red’s owner. Recognizing their potential, he funds their launch into the competitive hunter/jumper circuit. Against the cutthroat backdrop of competitive riding, Merritt and their groom, Beatrice, develop an attraction. Merritt also finds herself drawn to Carvin, a rival rider. But in Red’s mind, Merritt belongs to him alone. Anyone else poses a threat. And Merritt can’t foresee what he’ll do to keep her to himself. I’ve always wanted to write a horse book. I grew up around horses. As a baby, I sat in the saddle in front of my mother or father on one of our cranky gray mares on the farm where we spent the summers. As a young girl, I read and reread every horse story I could get my hands on. My favorites were Walter Farley’s Black Stallion series and Mary O’Hara’s My Friend Flicka, both about wild horses tamed by the boy they love. I also adored A Very Young Rider by Jill Krementz because it was full of photographs of a girl and her pony. When I was older, I became more serious about riding. My junior year of highschool, my family moved to Connecticut from Manhattan. I didn’t want to leave the small all-girls school I’d attended since 1st grade, so I commuted. In those days I wasalways on a Metro North train or driving my horses to horse shows in a two-horsetrailer I pulled with a pickup truck. At sixteen, I was a latecomer to the horse show circuit and I felt like an outsider. I had to be observant and work hard to fit in. 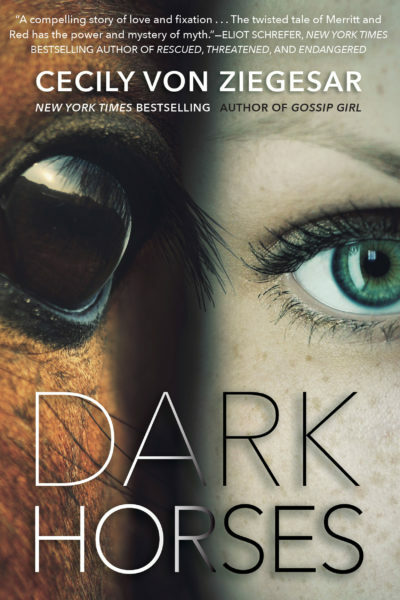 Merritt Wenner—the girl in Dark Horses—feels like an outsider in the horse world too. And what a colorful world it is, full of wealthy scoundrels and promiscuous partiers. As a writer, I’m fascinated by Anna Sewell’s Black Beauty. It’s so markedly different from other horse stories because it’s written from the horse’s point of view. I became determined to try that too, but being the writer I am, my horse wouldn’t be as earnest and well-meaning as Black Beauty. He would be more like Judd Nelson’s character in The Breakfast Club—smart and funny, with the potential to be a good guy, but damaged and full of resentment. My horse would attract an equally damaged girl. And maybe they could save each other. That became the story I wanted to tell: A messed up girl and a messed up horse meet and fall in love and try to fix each other; a classic bad boy tale with an unconventional twist. Writing Dark Horses was a great pleasure and a great challenge. It’s not like any book I’ve ever read or any book I’ve ever written. I’m excited to release it into the world, but also terrified. As the very last line in my first Gossip Girl book reads, “She couldn’t wait to see what would happen next.” Enjoy. Cecily grew up in Manhattan and went to an all-girl's school on the Upper East Side. She resides in Brooklyn with her husband Richard, the Deputy Director of the Public Art Fund, their children, Agnes and Oscar, and their two Cornish Rex cats. Von Ziegesar also owns an Appaloosa horse, Golden Rain. She is dreams of having a 'ranch full of cattle' when retired.